We can also offer outdoor storage but there are a couple of things you have to consider. First you have some advantages compared to indoor storage. 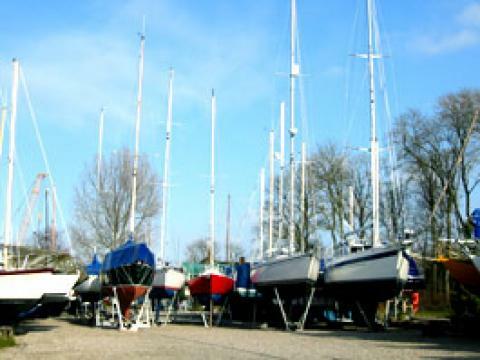 You can leave the mast on, but this depends on some other things, for example the weight of your boat, the draft and the length of the mast. All these things you have to take into consideration before you make up your mind. Safety is the prime concern. Another advantage is that you can decide when you want your ship out of and in the water again. With indoor storage, it depends on where you ship is placed. If it is in the back then you can of course come out at the end of April. You are dependent on the weather, but this can be solved by a little flexibility. The price is more than half and this is for some boat owners a good reason to store the ship outside. If all these things don't matter then winter storage is a question of taste. Just remember that inside your boat is protected against the weather. Another thing, which is well known, is that if the ship one day is sold, then the price is always a little bit higher if it has always been stored inside. But back to our subject: outdoor storage. If you choose to lay the mast, then it can either be stored on the ship or on our indoor shelves. For that there is an extra payment. If, as earlier mentioned, you decide to leave the mast on then this should never be for more than 5 years. No later than that there should be a mast check. The storage price is 12,32 EUR pr. m² exclusive VAT. The storage area is calculated in the following way (l.o.a. + 1 m x beam + 0,5 m). 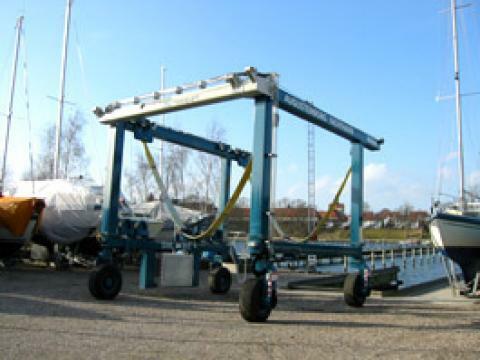 To the storage price you have to add a rental payment for a cradle, lifting/launching, rigging/unrigging the mast and high pressure cleaning. The prices for this kind of work you can see on the other pages. See "other expenses" under winter storage. Our shipyard, which is located in the old storage hall, as we used to call it, can nearly repair everything in wood as well as fiberglass. Our boat builders are very qualified and know how to do their job. Of course, you can carry out the repairs by yourself under our guidance. This kind of help we also offer. The decision is yours. If you are not a handy man we will do the job for you. We are your guarantee that the work will be done properly and with good workmanship. If this is of interest to you, then don' t hesitate to ask us for a price without obligation.